Hoje fui cortar o cabelo! O Inverno está quase a chegar e para o tempo frio prefiro ter o cabelo mais curto. 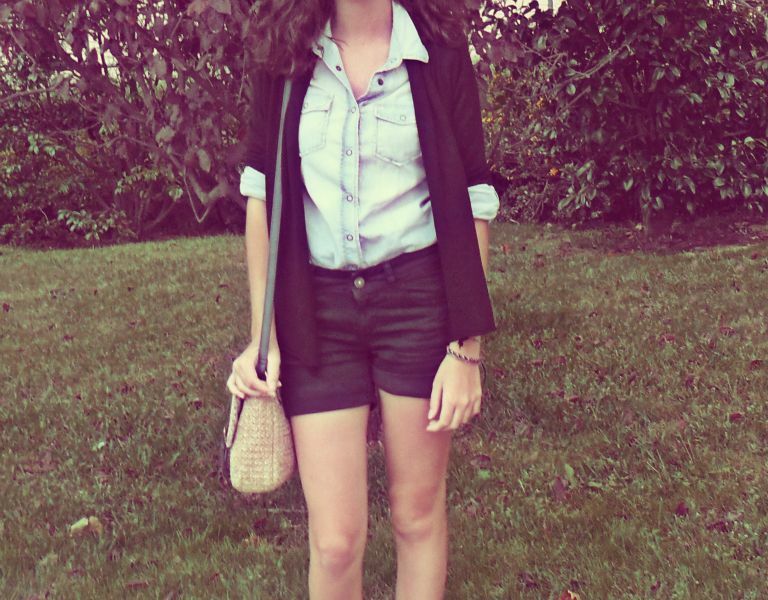 O meu look é inspirado na it girl Alexa Chung. Ontem vi umas fotos dela e fiquei apaixonada pelo estilo dela e então tentei recriar o seu look, mas com o meu próprio estilo. Usei uma camisa de ganga da Zara, calções da Sfera, casaco da Zara (comprei no ano passado e acho que fica bem com qualquer coisa) e carteira da Springfield. Today I cut my hair! Winter is coming and for the cold weather I prefer shorter hair. My look is inspired by the It Girl Alexa Chung. Yesterday I saw some pictures of her and I was in love with her style and then tried to recreate her look, but with my own style. I wore a denim shirt from Zara, shorts from Sfera, cardigan from Zara (I bought it last year and I looks good with anything) and bag from Springfield. Love Alexa Chung and her casual style and you recreated it perfectly! cute outfit!like it a lot!and yes,alexa is amazing!nice post! Love this outfit, that top is fantastic! You have a marvelous blog! I love Alexa Chung too, she's so pretty. You hair is gorgeous, love those curls. And your high-waist shorts look awesome too! I'm a new follower, would you follow me? Hey sweetie, i like you new hairstyle, yay! i am in love with your style as always :) check out my blog? Can't wait to see your hair, and Zara is pretty amazing. Vayaaa! me encanta tu blog, es genial enserio! Te sigo desde ya y me pasare mucho mas a menudo, no me perdere nadita :) jajaja espero que visites mi blog y que me sigas si te gusta, claro! Por aqui te lo dejo http://deserteaglefeathers.blogspot.com GRACIAS y suerte con tu blog! This is a fantastic outfit! Simple and chic... just how I like it.